Here is my June online income report. It's time to discuss how I make money online and share my income and expenses. I've been publishing income reports since April 2015. Writing that date is crazy! I can still remember writing that post and it feels like yesterday, but at the same time, like a lifetime ago. If you are new to reading blog income reports, here's a quick refresher! My most popular income report is still my very first one! Two years ago, I published my first income report proudly stating how I made $60. It took me about four months to earn any income from my blog. That was the hardest four months ever because I was so new to blogging and wasn't sure what I was doing. Earning that first paycheck was the best feeling ever and confirmed that my hard work was starting to slowly pay off! 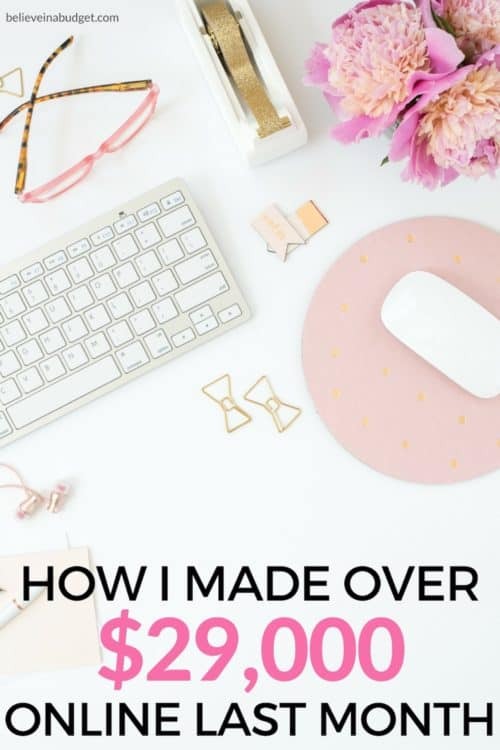 Although there were a few months my income dipped down, I consider my overall experience with blogging and my online business totally worth it. I really like going back through all of my online income reports to see what worked and didn't work. I can also gauge how different income streams are performing. For example, most of my income in the early days came from freelancing. Today it comes from affiliate income and my own products and courses. As I mentioned last month, May was the start of a big transition for my blog and business. This had me a little worried about June because I've been on work overload with the amount of projects happening simultaneously. It's like I was dreading checking in on how my month was going because I didn't want to know if my blog and biz was taking a hit in the summer months. While I've only been blogging for 2.5 years, this is my third summer as a blogger. Since I still consider my blog fairly ‘young', my site has been growing sine I launched in 2015. Does this mean I'm an official, experienced blogger who can say she has experienced the ‘summer slump'? Awesome! Creating products has been vital for my blog. I also can't stress enough about how important affiliate income has been for my blog and business! June continued to be a crazy month for Believe In A Budget. Things have been a little out of control, which I'll explain more below. It was also my 20th month I have been self employed << feels awesome writing that! I highlighted my June 2015 and June 2016 above to show you my progress these past two years. I will be the first person to say that I think this is totally bananas. The online world is nuts! If you had told me two years ago I would make over $80,000 in the three months, I would have laughed hysterically. I'm not sharing this data as way to pump myself up. This is to show YOU that anything is possible. If you've been on the fence about starting your dream blog like I did, go for it. Anything is possible. I went into blogging knowing NOTHING and this has surpassed anything I could have thought possible. You can learn more tips here about starting your dream blog, etc. You guys, every day when I wake up, I literally can't believe this is what I get to do! There is no sense of entitlement and I still have a small, tiny fear that this could all go away one day. Because of this small amount of fear that I can't seem to shake, I'm still hustling. While I answer a lot of emails from readers and fellow bloggers, one common question that I get is how I got started. I took Elite Blog Academy in 2015 – I was in the second class! If you could see the roster of other bloggers that took the course when I did, you'd be blown away by the who's who on the list. Many of them are CRUSHING it today!! If you want to learn more about Elite Blog Academy, you can do so here. It was the first course I took that helped me learn what to write about, grow my blog, figure out my VA biz and create my first course. If you are unorganized and need some planning (you guys know I love planning), you can get organized with this FREE blogging workbook. I believe in Elite Blog Academy so much, I'm going to Activate (aka the EBA conference) in the fall. Are you going? In terms of affiliate income in general, to this day I only recommend products, courses, and resources that I've personally used. I've pretty much been using the same affiliates since I started my blog. In fact, I used many companies before I had Believe In A Budget and didn't even know what being an affiliate meant! It wasn't until after I started blogging, I realized I could recommend them to other people! So it's been a nice, organic way to go about doing things. If you need help growing your affiliate income, take a look at this course. • $408 LeadPages I decided to invest in LeadPages and purchased a two year plan. This will allow me to save a whopping $400 over the next two years. LeadPages and Drip are owned by the same company, so they work really well together! • $699 SamCart I purchased an annual plan. The monthly plan would have cost an additional $600 over the course of the year, so this made much more sense. I slowly started to integrate SamCart last month into my checkout process for one product and it's been paying off. It was a smart move and I plan on moving all my products and courses over to SamCart this month. • $394 Accounting firm I hired a local accounting firm to help me on a monthly basis. The actual amount per month is going to be much cheaper, but between my blog and business, rental income and other personal things, it was time to hire an accountant to make sure I'm spending and saving wisely with my blog and biz. • $0 Quickbooks Self Employed I got a free one year subscription since I used TurboTax last year. Even if it hasn't been free, my accountant still recommended I use this software. I track all my biz expenses and my accountant has access to the software as well. My favorite part is that I can download the app for my phone and it tracks all my gas mileage for me! That's way more convenient than me trying to write it down or remember where I was going. Total time saver. Here's a coupon for 50% off! • $0 Tailwind. I pay for this annually. Tailwind is the scheduler I use when I do all my pinning on Pinterest. It’s my favorite scheduler I use for myself, recommend to clients and for my students. • $0 Bluehost. I pay for my hosting annually. This is the company I used when I first started my blog and still use today! Here’s some ideas on what you can blog about and a tutorial on how to start your dream blog. 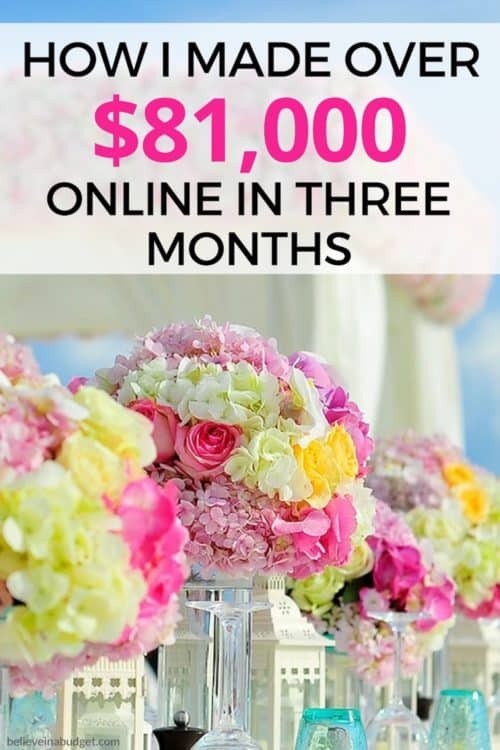 • $6,567.16 Affiliate + partner payouts This is my favorite expense to pay because it means other people have helped promote my courses and products 🙂 This also includes payment to my JV partner Gina on our shared course Become a Pinterest VA TODAY! I still have to deduct around 30% of my income for taxes as well. This also doesn't include about 4-5% in fees from Stripe and PayPal keep. Why were my expenses so high? This was my most expensive month I have had since launching Believe In A Budget. Roughly 80% of my expenses were joint venture and affiliate payouts. This is tricky to report because there is so much more work involved when sharing a course with someone. It's also the most rewarding since I can enjoy the success with Gina (HorkeyHandbook.com), but I'll be straight up. Figuring out all the money, how much affiliates earn, what to pay ourselves, etc. leaves us exhausted! Fortunately, we are like minded and don't nit pick the small things. Fortunately, Gina is one of my BFFs! Next month I'll be meeting up with Gina (as well as Allison from AllisonLindstrom.com) in Las Vegas. We are going to let loose and have fun to work our butts off, brainstorm and hang out. Ok, let's get real – woohoo, Vegas here we come!! I also invested in myself and my blog + biz by purchasing annual plans instead of monthly plans. If you are just getting started blogging and are in the beginning stages of earning income, stick with the month to month plan. This way you can explore different platforms, research and save money. Outside of purchasing an annual hosting plan, I took my time deciding what products and platforms I wanted to invest in. It's been a little over two years and I'm just now committing to annual plans, ha! I've always been slow to make decisions and spend money, but I'm 100% confident and happy about all my expenses that I mentioned above. Up until this point, I have pretty much been doing everything myself, except for major tech issues. I think it's really important that I know what I'm not good at doing! It's definitely worth outsourcing tasks that I know someone can do better and quicker. For the past few months, things have been getting a little crazy though. I've been finding myself falling behind and trying to do everything by myself. This pretty much resulted in NOTHING getting done. Seriously. I realized that I was going to drive myself nuts and have a breakdown. I decided to make the leap, invest in myself some more, and hire help. Like everything else, it took me some time to identify what I need help with and what will give me the highest ROI (return of investment). If you subscribe to my weekly emails, you probably saw that I was hiring for one or two part-time positions. Within a week, I received over 140 resumes – holy crap! I'm still sorting through everything and figuring out what's best for my blog and biz moving forward. Not gonna like, these resumes are pretty freakin' awesome! Gina and I launched a quick, 2 day flash sale for Become a Pinterest VA TODAY! Like usual, it surpassed my expectations with how well the course resonated with virtual assistants and people looking to get started in the VA world. Every time we launch the course, Pinterest Presence and my Pinterest pin templates gets a boost in sales as well. Yippee! I worked with a biz coach – in person! – to help me create a plan of attack for KristinLarsen.com. I originally had small and narrow plans for the site; my coach helped me look at the big picture and how I could be more impactful with my platform. I went on a planning mission and figured out exactly where I need to be in the next six months. While last year I was really organized and had my sh*t together, this year has been really out of control. I don't know what happened this year! As I mentioned in my recent life update, as my income has increased this year, I spent the first six months of the year dealing with anxiety and stress with this blog. It's a weird problem as most people probably wouldn't identify making more money as a problem, but it caused me a lot of panic. You can read my recent life update to learn more about how I dealt with anxiety, guilt and stress. Anyways, I put together a solid plan for the second half of the year. I created spreadsheets, mapped out everything in my planner, created templates and more. I bought multiple calendars and pens, color coordinated my life and am ready to rock! Much of this was for my benefit, as well as for the new VA's that I bring to team #BelieveInABudget. I'm feeling more organized, but I cannot wait to hire help! Finally, while June was awesome, I'm nervous about July. Things have slowed down and my income is already taking a hit because of the ‘summer slump' – I'm nervous! Kristen, it’s amazing to see the progress you’ve made. If I may ask, you said that you’ve been promoting the same affiliate products since you started. Do you mind me asking what products these are that you are promoting? Thanks, I only promote courses, products or apps that I have personally used or mentioned on the blog! Girl, I’m so excited for you! I’m in EBA right now (and kicking myself for not doing this 2 years ago when I first thought about it)! I’m going to Activate too! Look forward to meeting the chick who inspired me to start this to begin with!!! EBA was HUGE for me starting out! Glad you signed up!! I’ll be sending out an email beforehand to everyone on my email list to see who will be there. I plan on buying everyone a coffee or a cocktail so I can say hi in person 🙂 Can’t wait to see you there!! Yeah girl, partaaaayyyy EBA style! Whoop whoop! I’m happy to hear how well things are going for you and the continued success you’re having with your products. It’s deserved. You’ve worked hard! Keep going. I can’t wait to see where this leads. Thats too impressive. Can you please tell me what is your traffic source?